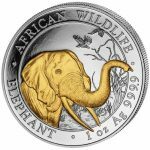 The Silver Elephant coin series from the Bavarian State Mint has quietly grown to become one of the most coveted silver coins for sale in the precious metals market today. 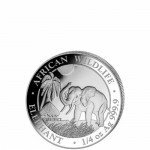 The coins were originally introduced in 1999 and today have expanded to offer the same great variety to investors and collectors found in the likes of the Silver American Eagle, Silver Canadian Maple Leaf, Silver Chinese Panda, and silver coins from the Perth Mint of Australia. 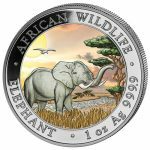 Each year the Silver Elephant coins have a new obverse design focused on the African elephant, one of Earth’s most majestic animal species. 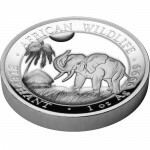 The coins were among the first in the world, behind the likes of the Silver Panda and Silver Kookaburra, to adopt this rotating design on the obverse of a silver bullion coin. 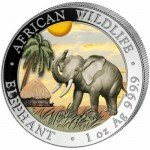 To learn more about this incredible coin series, read on! 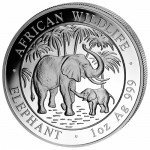 When the Silver Elephant coins were first introduced by the Bavarian State Mint, the coins were actually issued for the nation of Zambia. 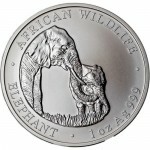 From 1999 to 2003, the Silver Elephant was known as the Silver Zambian Elephant coin series. Most of the major features of the collection were the same. 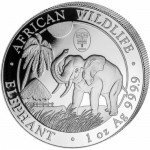 The Bavarian State Mint issued the coins with .999 fine silver content, One Troy ounce weight, and a new design on the obverse each year. However, in 2004 the nation of issue was changed from Zambia to Somalia. 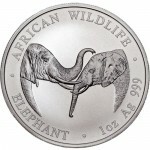 The new Silver Somalian Elephant coin was introduced in 2004. Little actually changed following the swap from one African nation to the next. 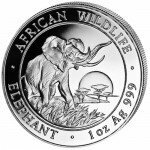 The coins still had a new elephant design on the obverse each year and featured .999 fine silver content. 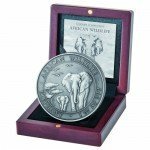 The major changes came in the form of the reverse design, which was now the Somalia coat of arms, and the face value which was now issued in Somali Shillings. 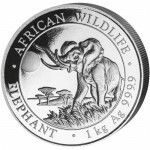 From 2004 to 2008 the Silver Somalian Elephant Coins were available in strictly limited mintage figures. 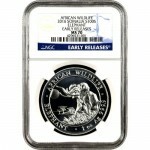 The coins were capped at just 5,000 annually through 2008. 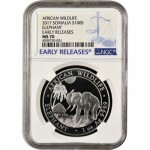 The first big change to the program came during this period, with the face value of the coins adjusted downward in 2007 from the original 1,000 Somali Shillings (2004-2006) to 100 Shillings, which remains the official face value for the 1 oz silver coin in this series to this point in time. 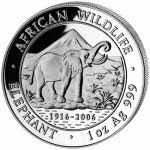 The Bavarian State Mint continues to pursue this higher mintage level, often coining the Silver Elephant without any mintage cap in mind. 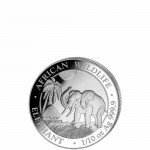 The next major change to the program came in 2016 when the Bavarian State Mint increased the metallic fineness in the coins to .9999 fine silver from the previously used .999 fine silver. 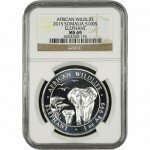 The Silver Somalian Elephant cemented itself as a leading precious metal option in 2017 when the Bavarian State Mint significantly expanded the collection to attract even more investors and collectors. 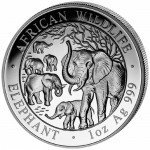 For the 2017 release of the Silver Somalian Elephant, the Bavarian State Mint introduced six more weights in the silver coin collection. 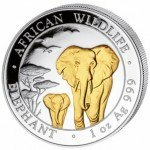 When the coins are released in the bullion series each year, the Silver Elephants are available in one of three shipment options. Individual coins ship to you inside of protective capsules. Multiples of 20 are packaged inside of mint tubes, and sealed boxes are also available for multiples of 500 coins. 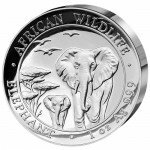 The Silver Somalian Elephant coins available at Silver.com are not just available in the standard silver bullion range each year. 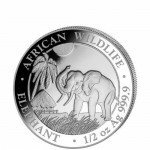 There are also multiple gilded and colorized options available for collectors and investors to consider when buying silver. 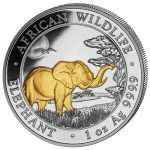 The Gilded Silver Somalian Elephant coin is a 1 oz silver coin with a thin layer of 24-karat gold applied to the design features of the elephant on the obverse face. These gilded coins are available with extremely limited mintage figures each year, often between 3,000 and 5,000 coins only. 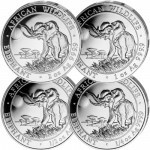 They maintain the original BU condition of the bullion coins. A coin in BU condition exhibits no signs of wear and tear, though you may notice minor flaws in the visual appearance ranging from breaks in the luster and spotted surfaces to contact marks from the coining process. 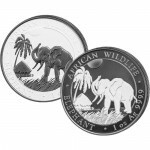 Also available each year are a Colorized Silver Somalian Elephant and a beautiful 2-coin Day-and-Night Set. 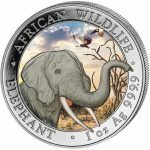 The colorized coin includes layers of lacquer colors applied to the design features of the obverse to bring the entire design to life, compared to the gilded coins which have the gold application only on the elephant. Colorized coins, like gilded, are limited most years to just 5,000 coins in total. Finally, that Day-and-Night Set includes the standard colorized coin with a unique nighttime coloration option as well. 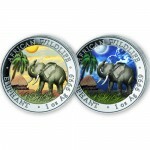 The day coin has bright blue skies, a yellow sun, and brilliant white clouds as the primary coloration features. For the night coin in the set, the white clouds are paled to yellow, the background sky is darkened to reflect the night, and the bright yellow of the sun is replaced by the cool glow of a white moon. 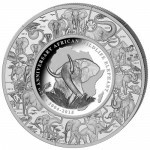 The Silver Somalian Elephant Day-Night Set has an extremely limited mintage of just 500 sets in total. All gilded, colorized, and Day-and-Night sets are finished by the German authorized dealer Emporium Hamburg. 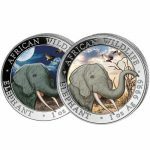 The Bavarian State Mint does not apply these finishes, with the coins offered to other dealers through Emporium Hamburg in limited supplies. 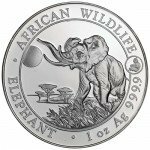 The 2018 Silver Somalian Elephant offers excellent insight into the ever-changing design on the obverse of the coin. 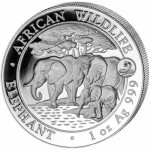 For this particular year you’ll find the image of a massive adult elephant standing in the foreground of the design, its head and trunk the only major visible features. 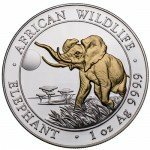 The creature’s trunk reaches upward toward the edge of the rim on the coin, almost as though it is going to reach off the surface at you. 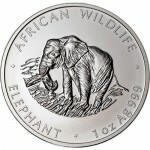 Engravings on this face always include “African Wildlife” above, “Elephant” to the bottom-left field, and the coin’s weight, metal content, and purity to the bottom-right field. 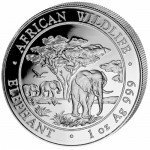 On the reverse of all Silver Somalian Elephant is the coat of arms for Somalia. 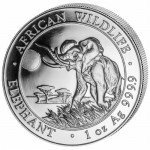 This design facet of the Silver Elephant series has never changed since 2004. The coat of arms includes a shield with horizontal lines across it and a singular star in the center, similar to the singular star on the national flag. Two leopards support the shield on either side and crossed spears below that are draped with a ribbon. Engravings on this face read “Somali Republic” above, the year of issue split on either side of the coat of arms, and the face value of the coin below. The Bavarian State Mint is one of Europe’s oldest operating facilities, and one of the oldest in the world. Located in the capital of Germany’s Bavarian region, the city of Munich in the state of Bavaria, the mint was founded in 1158. The Free State of Bavaria owns and operates the mint today, but its history is a rocky one. Within one hundred years of its opening, the mint was nearly closed. Originally lauded for its coins and a fixture within the region for coining currency for local economies, the 13th century saw the mint’s reputation come under fire as the low silver content of its products led to criticism and devaluation of currency produced there. In a rare bit of coining history, the citizens of Bavaria actually took action against the facility. The coin forges of the original Munich mint were destroyed and many of the individuals responsible for coining currency at the time were killed. Upheaval followed in the 17th, 18th, 19th, and 20th centuries at the Bavarian State Mint. For example, the mint was a dual-coining facility for Austrians and Bavarians during the Austrian occupation of the region from 1705 to 1714 following the War of Spanish Succession. The Bavarian State Mint was established as a national mint during the formation of the German Empire in 1871 (known as the Second Reich). Modern history has been kinder to the mint. It is now one of the five national facilities in Germany, even though it’s overseen locally by the Free State of Bavaria. It was previously authorized to print and strike German Deutschemark currency, and now fulfills production of Euros for the German people. 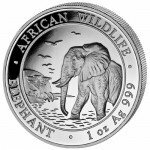 At Silver.com, you have a number of options available to pay for your Silver Somalian Elephant coins. We proudly accept the following forms of payment major credit/debit cards, which are processed on average within one business day. Bank wire transfers and PayPal payments process immediately, releasing your coins for shipping faster than other options. Paper checks have a 4-6 business day processing time, but like bank wire transfers come with a 4% discount on your overall purchase. 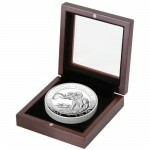 Silver.com offers a shipping fee that is tiered based upon the amount of your overall purchase. 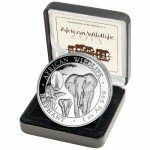 For any purchase over $3,000, Silver.com offers free shipping and insurance on your package. All products are discreetly packaged and shipped via the US Postal Service or UPS. In the event of lost or damaged items, we’ll work with the carrier to either recover your shipment or file a claim on your behalf to enable a refund. 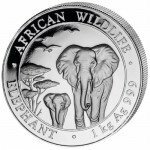 If you have any questions about the Silver Somalian Elephant coins, please don’t hesitate to contact a Silver.com associate. We’re available at 888-989-7223, online via live web chat, or through email. 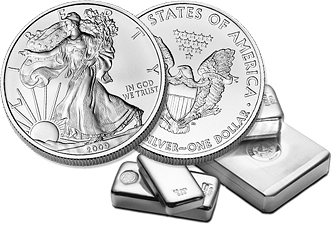 If you’re curious about the ups and downs of silver, you can always check our silver spot price chart online when buying!